When the average person hears the words “metal detecting,” they automatically imagine their weird neighbor spending their entire day on the beach in search of a rare treasure they may never find. However, that negative stereotype couldn’t be further from the truth. For thousands of people all around the country, being a metal detectorist not only provides an immense amount of joy, but it’s a wonderful hobby that can be enjoyed by all ages, genders, and backgrounds. There’s something magical about searching for rare coins, jewelry, and other artifacts while spending the day outdoors. The thrill of searching for rare items and other lost treasures. They enjoy treasure hunting while spending time with their family and friends. They love the thrill of searching for rare items and other lost treasures. They have a love of collecting items such as coins that are difficult to find and often carry meaning. The thrill of finding an incredibly rare item that can be sold for a large amount of money. In this in-depth guide, we’ll be covering the best metal detectors for 2019 as well as sharing some tips on how to get the most out of your metal detector adventure. Whether you’re new to the hobby or looking to improve your search game, this guide will help you have more fun and find more treasure! Ideal for Detecting Treasure in Extreme Ground Conditions. Distinguishes Between Targets and Unwanted Metals. One of the best all-around metal detectors on the market today, the Bounty Hunter TK4 Tracker IV is the perfect buy for amateur and professional treasure hunters alike. Like it’s brother model, the Land Ranger Pro, it offers an incredible amount of versatility at an affordable price. Explicitly designed to detect a wide range of objects and treasures with its waterproof, 8-inch transmitter coil, the Bounty Hunter TK4 comes equipped with three powerful modes: all-metal mode, discrimination mode, and two-tone audio mode. Even though the detector doesn’t have an LCD, it does have a low battery indicator that is just as easy to understand and will not drain your battery life as quickly as an LCD would. If you’re looking for objects within a two to three feet depth, it doesn’t get much better than the Bounty Hunter TK4. At a 6.7 kHz operating frequency, this metal detector can help you find a wide variety of coins at a depth of eight inches, as well as larger items in the two to three feet range as well. The TK4 tracker is perfect for tracking objects in even the harshest of conditions giving you plenty of flexibility on the location of your search. The Tk4 tracker is great at detecting silver, brass, gold, aluminum, iron, and steel. The legality of using metal detectors is dependent on a variety of factors all of which are important to consider when deciding where and when to use your metal detector. Staying on the right side of the law is crucial for long-term metal detectors usage and part of the overall detectorist code of honor. As any seasoned metal detector knows, it can be incredibly challenging to ensure you are on the right side of the law, which is half the fun of using your metal detector to find valuable items. Many countries around the world have different stipulations and rules regarding the use of metal detectors, but as a general rule, metal detectors are allowed if you aren’t trespassing on private property or have the sole intention of removing historical artifacts or harming sacred land. In many jurisdictions, you can be held responsible for your actions, regardless if you were intentionally breaking the law or not. For example, if you find the “perfect” spot to use your metal detector but it’s on private property or ancient grounds you can be fined or face additional consequences. The most effective way to ensure you aren’t breaking any laws is to speak with your town hall before any major excursions. Some town laws differ even in neighboring cities, so it’s important you keep up to date with the laws of each location you plan to use your metal detector. Thanks to the thriving metal detectors community, there are many resources online that can help you determine if areas are generally safe to use your metal detector. Here are a handful of places you can consider searching safely. Your front or back yard. Open fields or woodlands that aren’t private property. Again, to ensure you are not breaking any laws in your specific location, be sure to talk to your local city officials! How Deep Do Most Metal Detectors Go? While the coil size of the metal detector largely determines the depth in which the metal detector can work effectively, the majority of metal detectors are designed to operate at a depth from a few inches to several feet. There are several powerful metal detectors built to detect items at a deeper depth, but they are not nearly as common for the average hobbyist. How Accurate Are Metal Detectors? As with most items you purchase, the quality of the metal detector dramatically affects the accuracy and effectiveness of your detector. A budget metal detector may be a low-cost initial investment, but the reduced accuracy can cause you to miss items other high-quality metal detectors might find. What you’re primarily looking to detect will play an important role in which detector you should purchase. How deep your metal detector works depends on a wide variety of factors. Let’s take a look at some of those factors. The Depth Of The Object – How deep is the object you’re searching for? The further down, the harder it is for metal detectors to find. Soil Type – The type of soil also plays a significant role in the accuracy of your metal detector. Hard and firm soil can reduce your detectors effectiveness drastically. The Slope Of The Land – Objects that are underground at an angle can also be difficult to find. Generally speaking, searching for objects on a flat line is the most effective way to find items. Size Of The Object – Bigger items are easier to be picked up by your metal detector, but larger objects can also fall deeper into the ground. The Type Of Metal – The types of metal or minerals you’re searching for also impact the accuracy of your metal detector. Stainless steel is usually difficult for many metal detectors to pick up. Weather And Moisture – Wet sand and soil can decrease the accuracy of your metal detector. Furthermore, wet sand can push objects deeper down into the ground. Coil Size – The coil size of your metal detector largely determines the depth in which your metal detector can detect objects. If you go for a small coil, it is more sensitive and comes with better separation. However, if you go for a big coil, you have to pick between a concentric or a DD coil. The concentric coil gives you more of a cone-shaped search range; meanwhile, the DD coil ends up looking more like the blade of a knife. You have to pick your coil according to the surface you are searching. It’s never a bad idea to purchase a coil protector because even though you might not be putting your coil in water, something like a patch of moist grass can give it a shock. Frequency – Different detectors use different frequencies. A low-frequency detector can find objects at a greater depth but are less accurate. A high-frequency detector can be used at shallow depths with more accuracy. What Can Metal Detectors Not Detect? Most modern-day metal detectors are built to detect virtually all metals using the process of electromagnetism. Essentially, your metal detector will emit a wide variety of electromagnetic fields which will then interact with various metal objects wherever you are searching. A quality metal detector can detect the majority of metals, but most struggle to detect stainless steel due to its low magnetic field. Metal detectors also are not designed to detect stone, bones, diamonds, and pearls. While many metal detectors can also pick up gold nuggets, for example, that is not the primary function of their detection capabilities. If you want to make the most out of your experience using a metal detector, there are a handful of items you’ll want to consider investing in as well. While not all are required, some are more important than others in helping you find what you’re searching for! A good pair of headphones will allow you to listen to the sounds your metal detector makes when it detects metals or other objects in your area. Being able to hear the sounds from your detector clearly is crucial in finding the items during your search. Your metal detector will help you find the general area in which to dig, but the pinpointer will help you hone in on the exact location for you to search. Having both a shovel and a digging tool designed specifically for hunting small treasures will be essential during any day spent outdoors with your metal detector. Having a high-quality carrying case and bag is a must to store and transport your metal detector properly. Many metal detectors require batteries to function, so having multiple battery backups help ensure your search is never cut short. Let Your Treasure Hunts Begin. Enjoy Searching on Land & Water. Feel Connected to the Past. Superior Comfort for Avid Detectorists. If you’re looking for a high-quality and durable metal detector for you or your kids, the ToolGuards Detector is a wonderful option for all your metal detecting needs. Designed with three operating modes: all, target, or disc, the detector can be used effectively for a wide range of items you’re hoping to detect. This detector comes with an adjustable height option as well as an incredibly comfortable armrest to keep you comfortable during a long day of treasure hunting. One of the great things about the ToolGuards Metal Detector is that it includes a waterproof coil that you can use in shallow depths such as a shallow pond or saltwater lake or at the beach! While this detector isn’t built for super deep depths, it can find a variety of items at a one to two-foot range with no issue. Best yet, it comes with a one-year warranty, so you can be at ease during your next outdoor adventure! Can be Used in Water up to 10-Foot Depth. A bit pricier than some other options, the increased cost of the Garrett AT Pro Metal Detector comes with enhanced functionality and effectiveness. The AT Pro is designed for the professional in mind. Both lightweight and highly effective at finding most metal objects and items, this detector packs a serious punch. It comes equipped with high-res iron discrimination to help weed out the non-important objects, and digital target ID which allows you to home in on what matters most. The Garrett AT Pro can be used in the water at up to a ten-foot depth giving you incredible range to find some of the most valuable objects that have fallen into shallow water and sand. It also comes with premium volume control, as well as its signature all-terrain detector technology making it perfect for finding relics, coins, jewelry, and gold nuggets. The only reason this was not our #1 recommendation was that for the average metal detector hobbyist the price might be a little out of range. That said, if you’re looking for one of the best metal detectors around, you can’t go wrong with the Garret AT Pro. The Gold Digger can be used Anywhere. Motion All-Metal Mode and Trash Elimination. All Kinds of Valuable Metal from Iron Relics to Gold Coins. 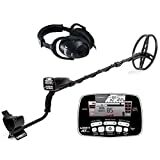 The Bounty Hunter Gold Digger Metal Detector is a reliable and affordable metal detector option for those just getting into the hobby. It can be used to find all kinds of metal, coins, and even small nuggets of gold, and includes a set of high-quality headphones to help you stay focused on the task at hand in crowded or otherwise loud places. The Gold Digger can be set to two different modes: all metal mode and trash elimination to help you find what you’re trying to find. It comes with a five-year limited warranty and a 7-inch coil. At a weight of just 2.2 lbs, it is also incredibly light and easy to carry. We hope this guide to metal detectors gives you more insight and helps you find what you are looking for when buying a metal detector. 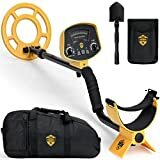 Whether you’re new to the metal detection world or want to find a new metal detector for your treasure hunt, the four metal detector’s on our list are an incredible value. 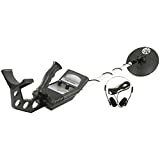 If you’re looking for the best all-around metal detector in 2019, you can’t go wrong with our top pick, the Bounty Hunter TK4 Tracker IV Metal Detector. If you’re looking for a children’s or beginner detector the Bounty Hunter Gold Digger is a great choice. If you’ve got a bigger budget or are looking for a high-level professional option, look to the Garret AT, and if you need something waterproof, the ToolGuards detector is worth a hard look. Good luck on your treasure finding journey!